My grandfather's older brother (Rifleman Charles Durrant, 2/Rifle Brigade) was killed on 9th May 1915 at Hill 60 on the Ypres Salient, or at least, that's what his family were told. With no reason to question the facts, Charlie remained "missing at Hill 60" for another eighty-five years, but a chance glimpse, in May 2000, of a memorial card to another missing 2/Rifle Brigade man highlighted the error of our ways. We had discovered Fromelles and the Battle of Aubers Ridge. The research moved quite quickly from the men of 2/Rifle Brigade to all those serving with the 7th and 8th Divisions and then onto Fromelles 1916, the 61st (South Midland) Division and the 5th Division, Australian Imperial Force. The similarities between the 1915 battle and the 1916 attack (fought over the same ground and with the same devastating results) were enough to convince me that further and more in-depth research was required. 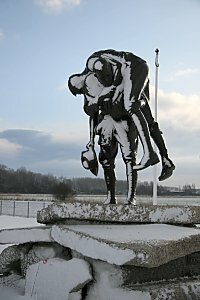 Prior to the discovery of the mass graves at Pheasant Wood, Fromelles had been known only for being the place where the AIF had experienced its first, and disastrous, taste of action on the Western Front. 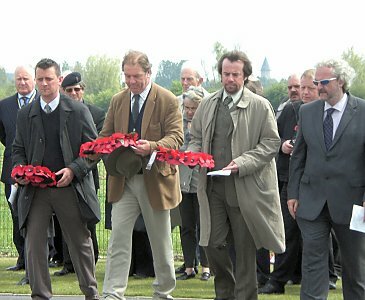 In February 2008 (and in an attempt to help raise the British profile in Fromelles), I became the British Historian and Representative for the Association Fromelles-Weppes Terre de Mémoire - 14/18, with Lambis Englezos becoming my Australian counterpart. In June 2008, following GUARD's success in proving the existence of the mass graves, the research went into over-drive. 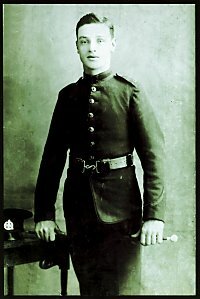 By July, I had an accurate list of missing British and Australian men from the 1916 action and in the August I received a telephone call from Peter Barton who had heard of my work and who wished to share his German research with me. Between us, we would attempt to put names to the men who would be recovered from Pheasant Wood. Peter's first visit to the Red Cross Archives in Geneva in December 2008 netted something in the region of 160 lists of names, lists which included the names of some of our missing Australian and British men. Peter made a first sweep of the lists before sending them to me for further scrutiny. We eventually extracted the names of 185 Australian and 46 British men, men whose names had appeared on German lists of English dead. Our research was made available to teams in both Australia and Britain (via the Australian Army and the British Ministry of Defence) and the search began for the families of these men as the first of the 250 British and Australian men were recovered from Pheasant Wood. Meetings at Whitehall followed in order to discuss and resolve omissions from the British Working List and in January this year, I was at Fromelles to see the first of "my boys" buried with full military honours. 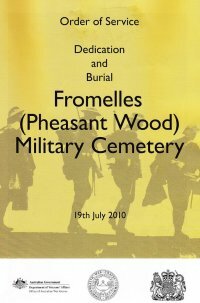 I could so easily say that my Fromelles-related research began with Uncle Charlie and ended on Monday 19th July 2010 at the new Pheasant Wood Military Cemetery, but hundreds of my men from both 1915 and 1916 (British and Australian) remain "missing" with no known grave and the search for them continues. Who knows? There may yet be more mass graves to find. commemoration ceremony 9th May, 2010.